If there's anything as or even more difficult than having to separate or divorce, it's telling your children that you've come to this decision and that mum and dad will no longer be together. It may be one of the most difficult conversations you'll ever have. It's natural for children to want to see their parents with each other so this announcement may give them their first heartbreak. As hard as it may be, kids still NEED to be told. They are perceptive human beings. They observe and feel more than we can ever imagine. Leaving them wondering in the dark and confused with what's happening may not be the best recourse. Adults see divorce for the complex situation that it is - the division of assets, children's time each parent, the financial bearings etc. Children, especially the younger ones, see it in self-centred terms, "Is it my fault? ", "Who's going to take care of me now? ", "Where will I live? ", "Don't you love me anymore?". IF they’re not asking these questions during the conversation the alternate is these thoughts are just lingering in their heads. Either way, you would want to answer these questions as honestly and as assuringly as possible. 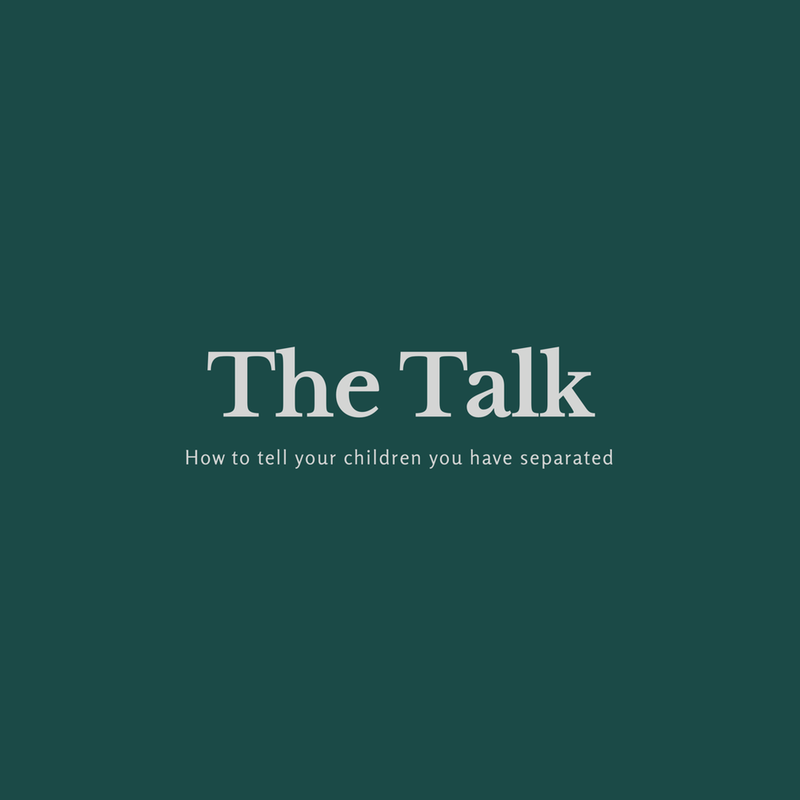 Before you have the TALK, plan together what you would say to the kids to avoid any confusion or another argument to ensue during the conversation. There's no perfect way to break this news to your children, but these tips may alleviate some of the pain that it may cause. Sit down with your children and talk to them TOGETHER. Explain the situation and stress that the separation is a decision made by both of you. Incorporate the words "we" and "us" as much as possible. Reassure your children that as parents, you will still work together to provide them with the guidance, care and love that they deserve. Pointing fingers at one another can cause not just distress to your children but further confusion. Children are likely to believe that that they are the cause of the break-up. Blaming one another will give them space to think that this is true. Give them constant reassurance that it has nothing to do with them. It would also help to say that you have done your best to fix the problems you've been having but, it just didn't work out. To be asked which parent they prefer is an awful position to put your children in. It is not a popularity contest. Make decisions based on the best interest of your children. Instead of asking them to choose, explain to your kids how things will change now that you have decided to separate. An example is your living situation. Let your children know what your plan is, so they know what to expect. They may feel bad about it at first but assuring them that the living arrangement that you have agreed on will be best for everyone can ease the blow. It will take time for your children to process the news that their parents are divorcing. There will be questions that will come up during the talk, and there will still be more as time passes. Be open to them and patiently hear your children out. Answer them with honesty but use comforting words that they would understand. Although divorce has such a negative overtone, staying positive in spite of the situation is still essential. Your children, amidst the transition, should always be your top priority. Make sure you let them know and feel that. Tell them what beautiful things new beginnings can bring. Assure them that even if their mum and dad are divorcing, you still love them all the more and that they have both of you no matter what.